The old king of political vulgarity, the proto-Trump, is back. The news of the day is that Silvio Berlusconi will be running for a seat in the European Parliament, reviving his political career after a ban imposed over a tax fraud conviction expired. He’s back. Berlusconi, who is infamous for merging Italy’s love of football with politics, confirmed today that he will “take to the field” once more and run for election as an MEP. And the 82-year-old will probably win it. His Harvey Weinstein-style treatment of women has never been something to put off Italian voters after all. Plus, we all know he really knows how to have fun, in grand style. Just ask a certain former Czech prime minister. His hardening stance on migration will go down well with nativists, populists and the extreme right. He has labelled illegal migrants a ‘social time bomb’ and has called for their expulsion. But the truth is, his return is bad news on many levels. For the European People’s Party, the home of his Forza Italia party, he could well prove to be yet another troublemaker who may (or may not) bring votes and seats but will hardly improve the party’s image. 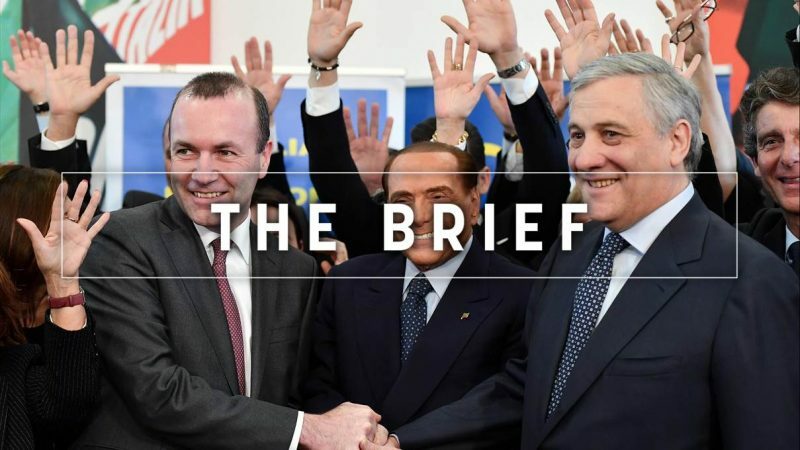 In Italy, his success in May is almost certain to spell trouble for the tense ruling coalition of the Five Star Movement and Lega, whose leader Matteo Salvini is considered close to, or at least not very distant from, Berlusconi. The two ruling parties are already worlds apart on many crucial issues and it could take just one wedge, or a nudge from someone powerful, to cleave them apart completely. During the Parliament vote on the Article 7 procedure against Hungary last September, Lega and Forza Italia voted against, while Five Star voted in favour. Berlusconi is also out for revenge on the EU battlefield. He was the first leader of a sovereign EU country to lose power as the result of a press conference. Many remember the events of October 2011 when Angela Merkel and then French President Nicolas Sarkozy openly derided Berlusconi. Two weeks later, he was kicked out and replaced by technocrat Mario Monti. British citizens already living and working in Belgium will be free to remain even in the event of a no-deal Brexit. That latter option may be taken off the table though, if a leaked phone call is anything to go by. If Europe is to protect us, we need to protect Europe, Spanish Prime Minister Pedro Sánchez told EU lawmakers in Strasbourg. He called for a more social, feminist, greener and united Europe. Greek PM Alexis Tsipras survived a confidence vote after a row over the landmark name deal with Macedonia that sunk his four-year coalition. Germany considers a Huawei 5G ban amid global backlash against the Chinese tech giant. The news comes a week after a senior Huawei executive was arrested on espionage charges in Poland. Deterrence talks between Washington and Moscow to save an arms control treaty collapsed this week. Citing Russia’s non-compliance, the US is about to ditch the landmark missile treaty. EU envoys, meanwhile, agreed to impose sanctions on Russians accused of Skripals’ poisoning. Tehran has dismissed the US-initiated Middle East summit in mid-February as a “desperate anti-Iranian circus” and the EU is struggling for a common position. Global risks are intensifying but the will to tackle them collectively is eroding, as forces across the planet call for “taking back control”, the World Economic Forum warned in its latest report. The European Parliament approved a list of recommendations calling for a rethink of the EU authorisation procedure for pesticides. Speaker of the US House of Representatives Nancy Pelosi pays a visit to Brussels.